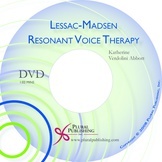 Details: 24 pages, B&W, Softcover, 8.5" x 11"
Dr. Verdolini Abbott's Lessac-Madsen Resonant Voice Therapy provides an overview and demonstration of the Lessac-Madsen Resonant Voice Therapy, for clinicians certified in the technique. Dynamically and thoughtfully presented, this program should be on the shelf of every voice clinician working with patients with voice disorders. "The clinician manual describes how clinicians should conduct eight therapy sessions using LMRVT. It covers taking a complete case history, stretching exercises, and the core resonant voice exercises. The best part of the clinician manual is that it outlines exactly how the treatment should be carried out. It moves from stretches and simple humming to practice words and chanting. The exercises get more complex as the program advances, and the manual tells the clinician exactly in what order to proceed." Katherine Verdolini Abbott is Professor of Communication Science and Disorders in the School of Health and Rehabilitation Sciences at the University of Pittsburgh. Dr. Verdolini Abbott holds memberships in the American Speech-Language-Hearing Association, National Association of Teachers of Singing, and Voice and Speech Trainers Association. She is the current and former recipient of several research awards from the National Institutes of Health for the investigation of voice disorders and their treatment, and has interest in alternative and complementary medicine. She developed the Lessac-Madsen Resonant Voice Therapy (LMRVT), which honors esteemed voice and speech trainers Professor Arthur Lessac and Dr. Mark Madsen. She has conducted both basic science and applied research on the the method and has trained hundreds of clinicians around the world in its use. Her work in the area of cognitive substrates of motor learning and their relevance for voice therapy is unparalleled. Considered a master in her field, LMRVT is taught and appreciated by clinicians around the world. Details: 84 pages, B&W, Softcover, 8.5" x 11"